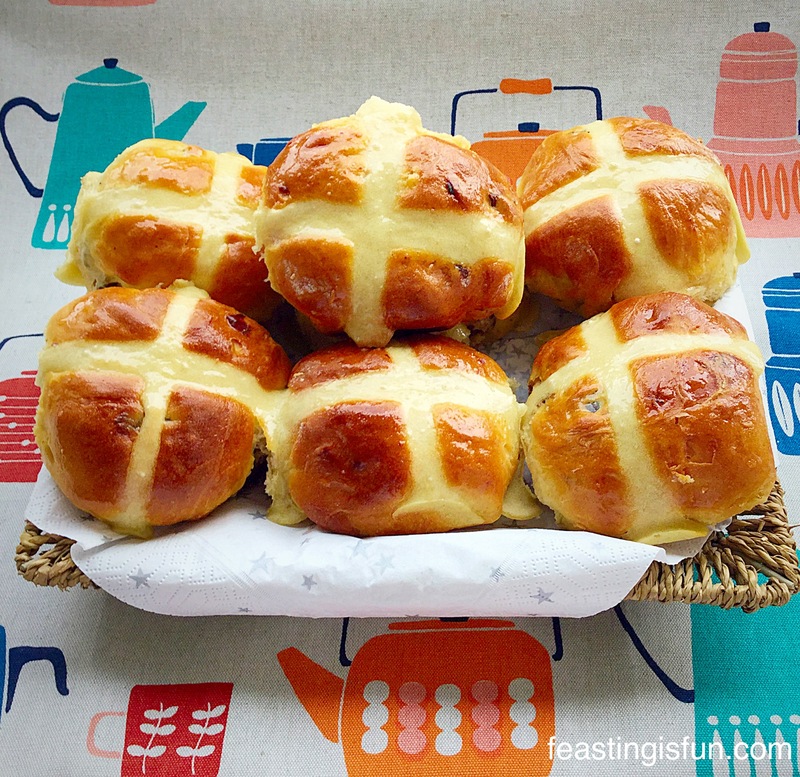 Easter seems such a long time ago now and yet I still find myself missing the adventure of creating new hot cross bun flavours. So, instead I took one of my favourite flavour combinations this year, the Ginger Date Hot Cross Bun and played around with it. 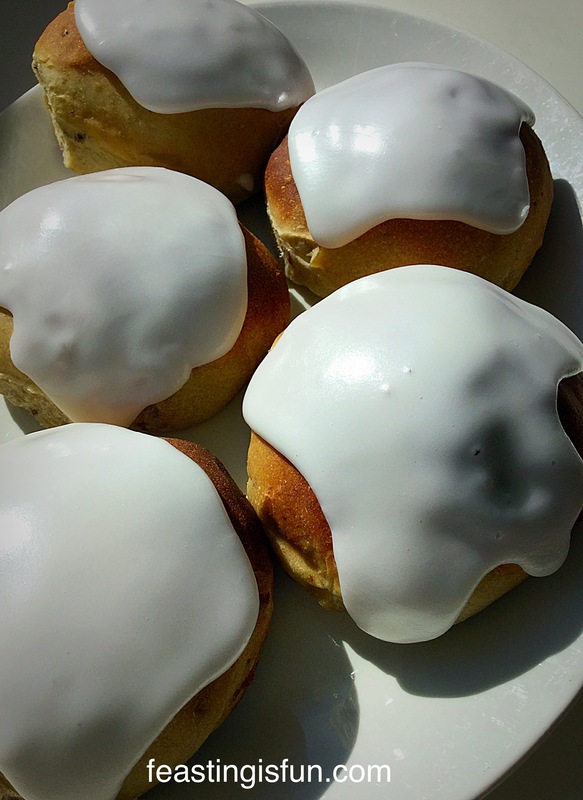 The result is these utterly yummy Date Ginger Iced Buns. Date Ginger Iced Buns full of fruit and flavour. A sweet yeasted bun packed with medjool dates, stem ginger and freshly grated nutmeg. Baked until golden brown and then slathered with thick glacé icing. These Date Ginger Iced Buns are sticky, not overly sweet, finger licking portions of loveliness. I adored the flavour combination when I made the hot cross buns, but knew I needed to vamp up the recipe. When toasting hot cross buns, the heat enhances the flavour, as these buns were to be eaten cold I knew I’d have to pack more flavour in. After making these three times I am finally happy with the recipe. Date Ginger Iced Buns with a hint of nutmeg. Playing around with recipes is part of the fun of being a food blogger. 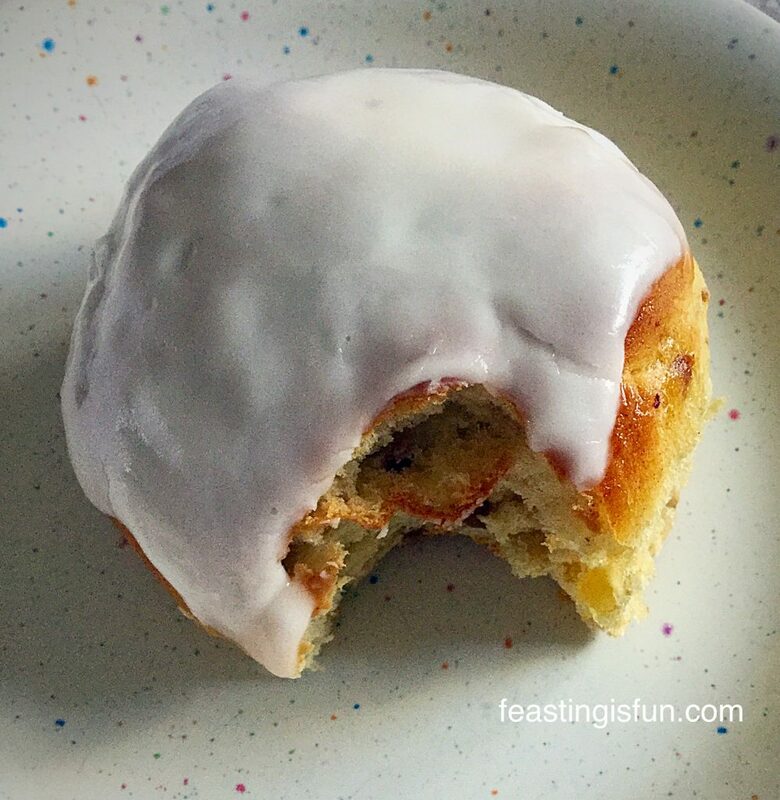 When Waitrose ran a competition on Twitter for new hot cross bun flavours I was absolutely in my element and went on to make a couple of my suggestions, including the Cherry Bakewell Hot Cross Buns. Over the recent months, experimenting in the kitchen with new recipes, carrying out reviews and writing this blog, has really helped me. 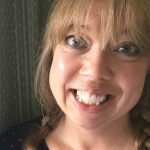 My body is still completely messed up, with me having around sixty seizures a week, yet focusing on my blog, although not easy at times, has definitely given me a sense of accomplishment. It is hard not to become frustrated and I frequently do, that is when I re-read all of the lovely comments you leave. 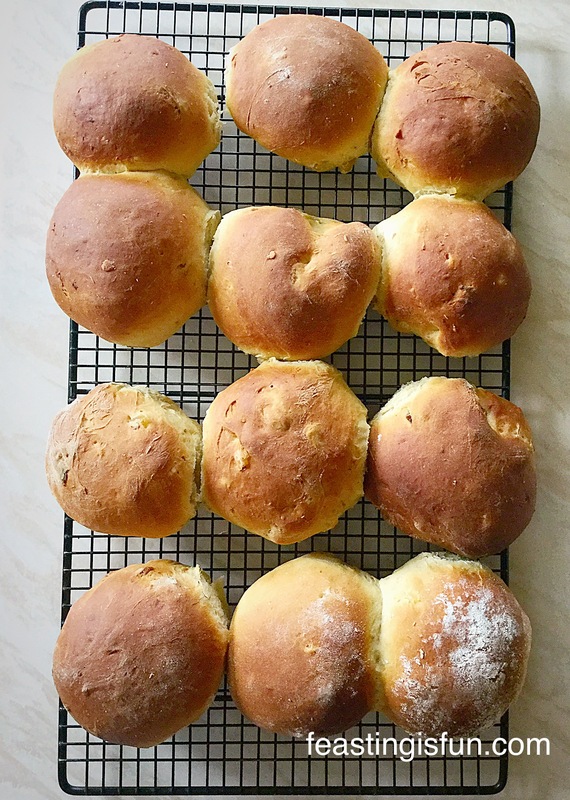 Today I am really struggling with pain, which means it’s hard to concentrate on writing these words – yet this recipe is so good, so delicious, that I really want to share it with you so that you can make the Date Ginger Iced Buns over the weekend. I write this not to elicite sympathy from you, simply to explain what my reality is – see Adapting to a new normal. Sometimes life isn’t all sunshine and roses. Usually the kitchen is my retreat, somewhere to escape to as a distraction, yet today my bed is my sanctuary. On a more positive note, one of the most enjoyable reviews has been using the delicious medjool dates from The Medjool Date Co. This recipe has used the last of the dates, sob. They are completely addictive and utterly divine. I might have made more recipes had I not snaffled so many whilst cooking and baking with them! I will definitely be getting more of these delicious medjool dates. Their sticky, not overly sweet flavour is so versatile in cooking/baking and they are wonderful to snack on too. I highly recommend them. This method is for use with a bread maker or stand mixer, if you wish to make by hand please do, the quantities are the same, make sure you knead the dough for 10 minutes before adding the fruit. Tip the dough out on to a clean, floured surface. Divide the dough in half and then divide each half into 6 portions. You can use scales if you want to be absolutely accurate. Flour your hands well, this dough is sticky. Form each portion of dough into a ball shape. Place on to a buttered baking tray, leaving space in between each bun to allow it to rise. When all the buns are shaped cover the baking tray with a clean tea towel. Leave in a draught free place until the buns are doubled in size – approx 1 hour. When the buns are almost doubled, preheat the oven to 200C/180C fan, gas mark 6. Beautifully risen buns ready for the oven. When the buns have doubled in size place the baking tray into the centre of the oven and bake for 20-25 minutes. Enjoy the smell of these delicious buns baking in your oven. There’s a reason, during the build up to Easter, that you smell Hot Cross Buns as soon as you walk into a supermaket!!! The buns are baked when they are golden brown and sound hollow whe rapped on the base with you knuckle. 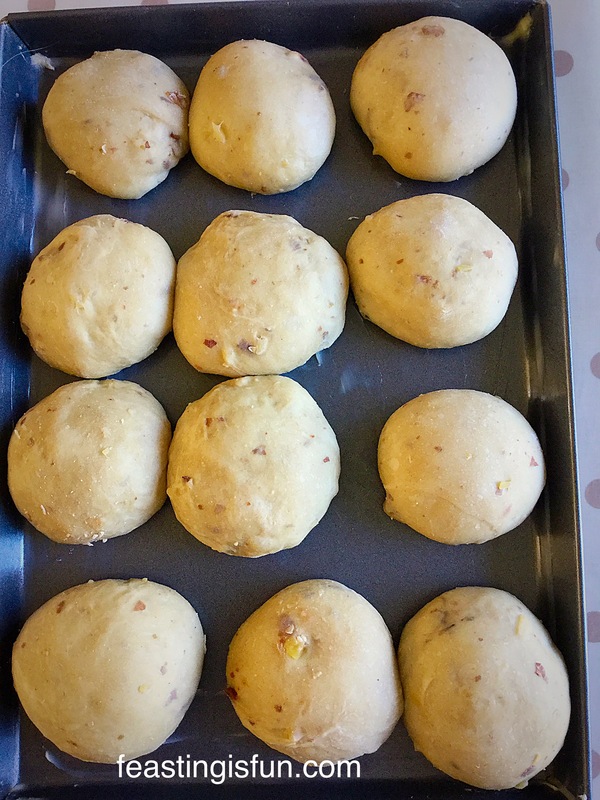 Once baked remove the buns from the oven and immediately transfer them to a cooling rack. Golden baked, fruit filled buns. Leave the date and ginger buns to cool completely before icing. Sift the icing sugar into a bowl and add the syrup from the stem ginger jar. Add just enough water 2-3tsp to the bowl to make a very thick, but still spoonable paste. 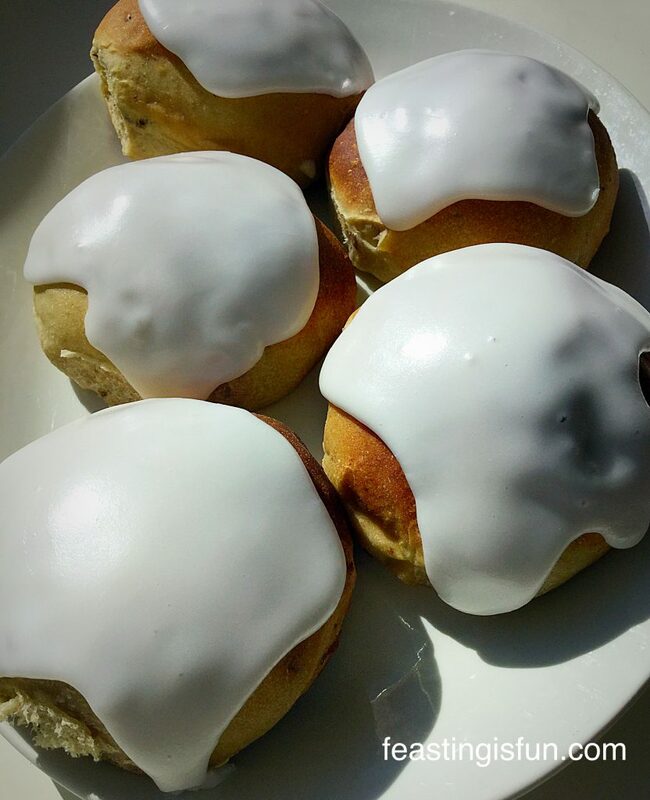 Using a dessert spoon, carefully swirl some of the thick icing on to each of the buns. The icing will drip very slightly. Allow the Date Ginger Iced Buns to set on the cooling rack. Now it’s time to put the kettle on as all of your neighbours will soon be knocking at your front door, drawn in by the tantalising aroma of freshly baked fruit buns!! Date Ginger Iced Buns sweet fruit filled delights that you want to bite! A quick tip, if these aren’t all to be snaffled straight away, is to pop half of them into a freezer bag – un-iced. They can be frozen for up to a month. Defrost fully before icing, or skip the icing and enjoy the buns toasted. with lashing of butter. 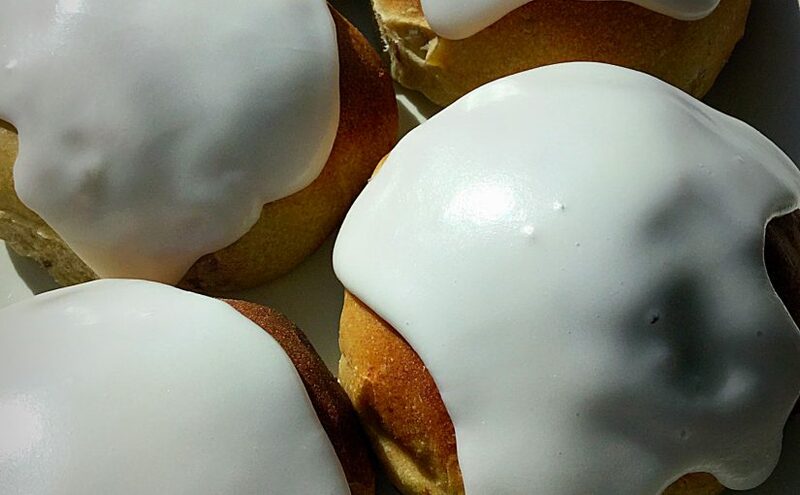 The freshly iced buns will keep for 24 hours in an airtight container. I use an old biscuit tin. 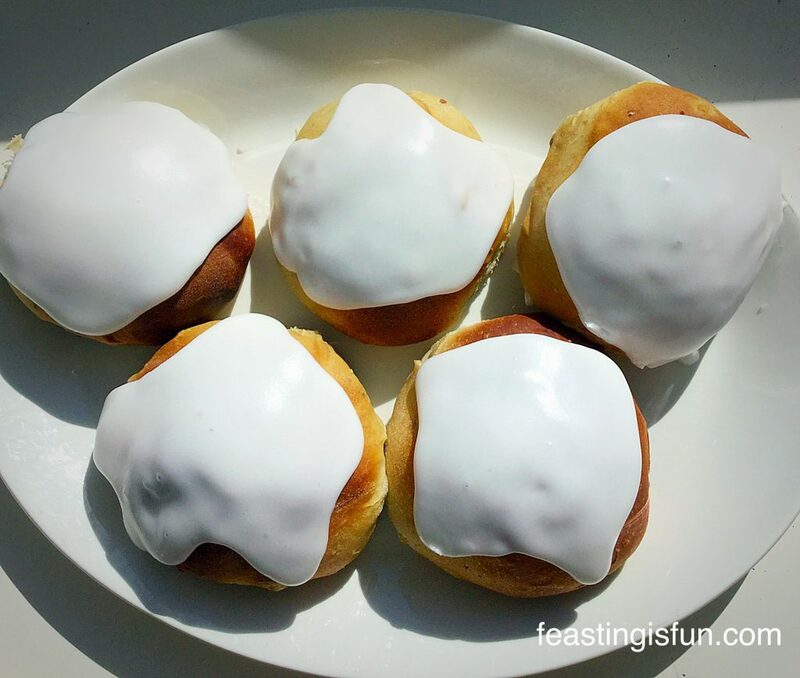 Date Ginger Iced Buns perfect for afternoon tea! 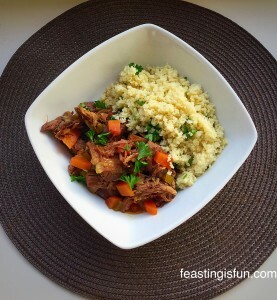 Do let me know if you try this recipe. I love getting feedback on my recipes. Ginger Date Hot Cross Buns a complete taste sensation. Morrocan Lamb Stew flavored with middle eastern spices and medjool dates. The Medjool Dates were truly a feast in themselves, yet I also found them so versatile in the kitchen. 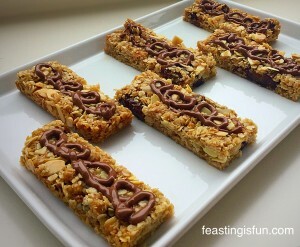 Keep your eyes open for more delicious date recipes on Feasting is Fun! Whatever you make or bake in your kitchens this weekend,I reallythat hope you have fun and enjoy sharing your feast with others. The Medjool Date Company provided me with the dates for this recipe. All views, opinions and content contained within this post are my own. Please see my Disclosure Policy.